Disability discrimination in the workplace means treating a job applicant or an employee differently because of a current or past disability. It can also mean unfavorable treatment because of a perceived disability or an association with someone who has a disability. New York offers some of the strongest protections for employment disability discrimination in the country. If you experience disability discrimination in the workplace, a New York discrimination lawyer can help. Learn about protected disabilities, reasonable accommodations, and proving workplace disability discrimination on this page, or contact us to speak directly with a disability discrimination lawyer today. New York discrimination lawyer Charles Joseph offers free consultations to discuss your workplace disability discrimination case. Charles Joseph brings over twenty years of experience in discrimination cases. His firm has recovered over $120 million for clients. Reach out today for a free, confidential consultation. It is illegal for an employer to make employment decisions or treat you differently based on your disability. Employers cannot treat you differently because of your current or past disability, perceived disability, or your association with someone with a disability. If you have been the victim of disability discrimination in the workplace, you have protections under federal, state, and New York City laws. A disability discrimination lawyer can help. There is no list of protected disabilities or medical conditions that qualify as disabilities. Instead, the laws provide general standards. New York City defines “disability” broadly, as “any physical, medical, mental or psychological impairment,” including a history or record of such impairment. The law also applies to individuals who are recovering or have recovered from substance abuse problems, including alcoholism and drug addiction. New York state’s definition is somewhat more generous than the ADA, but less broad than the CHRL. Major life activities include: walking, seeing, hearing, speaking, breathing, learning, working, sitting, standing, lifting, thinking, concentrating, and interacting with others. It also includes major bodily functions such as digestive, bowel, bladder, respiratory, neurological, brain, circulatory, endocrine, and reproductive functions. The following is a list of conditions that are nearly always found to be disabilities under the ADA. While the ADA does not provide a list of protected disabilities, it does explicitly exclude certain conditions from being considered disabilities. Maladies such as broken bones, sprains, concussions, appendicitis and influenza are generally not considered disabilities under the ADA, because they are temporary conditions. However, under New York City law such conditions may be considered disabilities. Employers may not discriminate against you for your former alcohol or drug abuse, as long as you are in treatment or have been treated and are no longer abusing that substance. For example, your employer should make reasonable accommodations to allow you to attend AA or NA meetings, or to not attend company events where alcohol will be served. Employers do not have to accommodate current alcohol or drug additions. For example, they do not have to excuse tardiness because of a hangover. You are not protected if your employer mistakenly believes you are an untreated alcoholic or drug addict. Genetic conditions can be considered protected disabilities even when the condition has not progressed to a disability or disease. For example, if you faced discrimination based on a family history of schizophrenia, you would qualify for legal protection even though you are not currently diagnosed with schizophrenia. Even if you are no longer disabled, your employer may not discriminate against you based on a past disability. Employers cannot make employment decisions based on your disability or perceived disability instead of your skills and how well you do your job. This includes decisions about hiring, firing, discipline, distribution of benefits, promotion, compensation, job training, or any other condition of employment. It is illegal for an employer to create or allow a hostile work environment. Employers cannot refuse to engage with you in an interactive process regarding possible accommodation and to provide a reasonable accommodation that allows you to perform your job duties despite your disability. It is not against the law to treat a disabled person more favorably than a non-disabled person. You apply for a job for which you have experience and excellent qualifications, but you are not hired because the employer is worried your disability will increase their health insurance costs. When you apply for a job, the employer thinks you look very thin and assumes you have AIDS. The employer asks you to undergo a medical exam before deciding whether to offer you a position. This is discriminatory even if you do not actually have AIDS and are not HIV positive. Although you have had excellent performance reviews, your employer fires you because they are worried you will have to take off too much time for upcoming chemotherapy treatments for breast cancer. Employers cannot withhold a promotion because an employee has a protected disability. After working as an assistant store manager for several years, receiving exemplary reviews and an employee-of-the-year award, you apply for a promotion to store manager. Your employer refuses to promote you, saying the position requires you to have a driver’s license in order to take receipts to the bank, and you have epilepsy. You suggest some reasonable accommodations, such as taking a taxi to the bank, but the employer still denies you the promotion. Employers cannot blame discriminatory decisions on the anticipated reaction of other employees or customers. Your employer cannot refuse to hire or promote you because it believes your disability could make co-workers or customers uncomfortable. It is illegal for employers to discriminate against employees who they mistakenly believe have a disability. You can be the victim of disability discrimination in the workplace even if you do not have a disability. 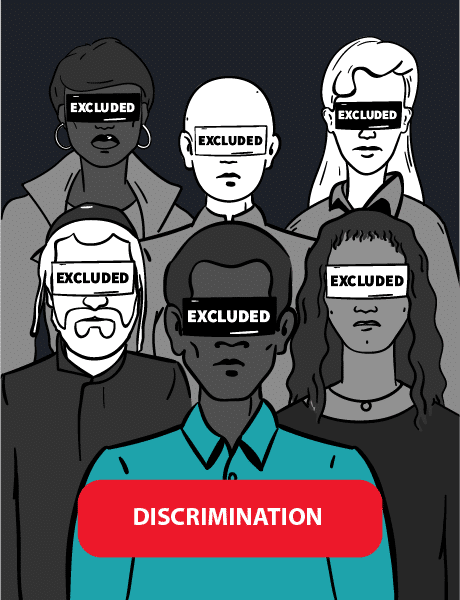 Laws against discrimination also cover past disabilities and perceived disabilities. Even if you no longer have a disability, your employer cannot discriminate against you based on a former disability. It is also illegal for your company to treat you differently because it mistakenly believes that you have a disability. Five years ago, you were diagnosed with a malignant brain tumor, but the entire tumor was surgically removed and you are now cancer-free. Your employer cannot deny you a promotion because they believe the position is unsuitable for someone with a brain tumor or they are afraid the tumor will come back. Based on office rumors, your supervisor believes you are HIV positive and refuses to let you work at the front desk, which would be a more lucrative position for you, because the employer is afraid it would upset clients. Unintentional employment disability discrimination can also be illegal. Job policies that appear neutral can be discriminatory if they harm workers with disabilities, as long as the policy is not job related. For example, an apparently neutral policy that requires all employees to have a driver’s license would negatively affect workers with epilepsy or a sight impairment. This requirement would be legal if the employer were hiring a bus driver, but harder to justify for a schoolteacher that has to split her time between schools. Employers must provide reasonable accommodations to employees or potential employees. Refusing to provide reasonable accommodations violates the law. However, in order to be protected under the law, you must be able to perform all of the essential functions of the job. If your disability entirely prevents you from doing the job, the employer can refuse to hire you. For example, employers can refuse to hire a blind applicant for a job as a school bus driver. If you require a reasonable accommodation in order to effectively do the job, your employer must provide the accommodation unless doing so would pose an undue hardship. You are a grocery store cashier, and your disability prevents you from standing for long periods of time. The employer could provide you with a stool or other seating. You are an office worker with a mental illness that makes you easily distracted by noise and movement around you. Your employer could give you an enclosed office or cubicle and a white noise machine. Employers can claim that an accommodation would create an undue hardship. Financial difficulty may qualify as an undue hardship. In addition, employers do not have to provide an accommodation if the disability presents a direct threat to safety and no reasonable accommodation can negate the threat. For example, an airline pilot with narcolepsy would pose a threat to safety, and it would not violate the law to prohibit the pilot from flying. Once your employer knows about your disability, they must work with you to determine whether a reasonable accommodation would allow you to perform your job. Under federal and state law, you must prove that you are able to do the tasks necessary for your job, with or without reasonable accommodations. Under New York City law, your employer must prove your disability makes you unable to do the job. You can be the victim of disability discrimination in the workplace even when no employment decision is involved. Harassment can create a hostile work environment, which violates the law. The standards for a hostile work environment vary. New York City law defines discrimination as when someone is treated “less well than other employees” because of a disability, as long as the ill treatment was more than petty or trivial. However, under federal law, the standard for proving harassment is much higher. You have to prove that the harassment was “severe or pervasive.” Comments or acts constitute harassment only if they occur often enough and/or are severe enough to create an intimidating, hostile, or offensive work environment. Employers have a responsibility to prevent a hostile workplace. A co-worker or even a non-employee, like a vendor, can be the harasser. Your employer is liable as long as they knew or should have known about the harassment. If the harasser was a supervisor, senior to but not in your direct line of report, the company will often be liable, especially under New York City law. Seek support from friends, family, clergy, and, if helpful, a mental health professional. Harassment at work can be very stressful, and it is a difficult thing to face alone. A New York disability discrimination lawyer can help. If you complain about disability discrimination at work, your employer cannot take any action against you. Employers cannot retaliate against applicants or employees who complain about discrimination on the job, file a charge with the Equal Employment Opportunity Commission (EEOC) or any state or city agency, or participate – including being a witness – in an employment discrimination proceeding, such as an investigation or lawsuit. As long as you had a good faith and reasonable belief that discrimination or harassment occurred, your employer cannot take any action against you for speaking out or participating in any investigation or proceeding. It does not matter if an agency or court determines that there was no discrimination. There are a number of options available to file a claim for disability discrimination in the workplace. You can file a complaint with the U.S. Equal Employment Opportunity Commission (EEOC), which handles violations of federal law, the New York State Division of Human Rights, which handles NYSHRL violations, or the New York City Commission on Human Rights, which is responsible for CHRL violations. If your claim falls under multiple laws, the three agencies that handle discrimination claims have what is called a “work-sharing agreement,” which means they cooperate with each other to process your claims. There is no need to file a claim with each agency. You just need to indicate that you want your claim “cross-filed” with the other agencies. Learn how to file a discrimination claim, how to file an EEOC complaint, or contact a New York disability discrimination lawyer for help. Applies to private companies with more than 15 employees, including employment agencies and labor unions. Covers all public employers regardless of size. Applies to companies with more than 4 employees. This includes state and local governments and domestic workers. Applies to companies with more than 4 employees. This includes municipal employers and unpaid interns, as well as independent contractors under certain conditions. However, if the charge also is covered by state or city laws, the filing deadline is extended to 300 days. You cannot file an ADA claim in federal court without first filing with the EEOC. Have a choice between filing your NYSHRL claim in state court or with the New York State Division of Human Rights. If you decide to file a claim with the agency, you must do so within one year of the incident, or within 240 days, if your claim includes a ADA claim. You must show that the employer’s action rose to the level of an adverse employment decision (i.e. termination or a denial of a promotion or bonus). Reprimands and negative performance evaluations only covered if accompanied by a reduction in pay or demotion. You must show the employer’s action rose to the level of an adverse employment decision (i.e. termination or a denial of a promotion or bonus). Reprimands and negative performance evaluations only covered if accompanied by a reduction in pay or demotion. You only need to show differential treatment. Performance evaluations and discipline decisions are covered by the law, even without reduction in pay or demotion. Hostile work environment requires severe and pervasive harassment. Hostile work environment requires severe and pervasive harassment. The standard for harassment is lower. It is defined as more than a “petty slight” or “trivial inconvenience.” You have to show that, because of your disability, you have been treated worse than other employees. An ADA lawyer can also help file disability discrimination cases under New York law. Disability discrimination attorneys protect employees who experience disability discrimination in the workplace. Back Pay: If you lost wage, bonuses, or benefits because of disability discrimination at work, the court can award back pay. This equals what you would have earned without the disability discrimination. Reinstatement: Employers who fire or deny a promotion because of disability discrimination may have to give their employee a job or promotion. Front Pay: Front pay helps make victims of disability discrimination whole. Courts award front pay to help discrimination victims return to the level of pay they had before their employer discriminated against them. Compensatory Damages: Victims of disability discrimination may have out-of-pocket expenses for therapy, a job search, and lost wages. Compensatory damages also cover emotional pain and suffering. Punitive Damages: Employers who violate disability discrimination laws may have to pay punitive damages to their employee as a punishment. New York City law punishes negligence, recklessness, or conscious disregard of worker rights with punitive damages. Liquidated Damages: Under certain laws, victims of discrimination also qualify for liquidated damages equal to the amount of back pay owed. However, disability discrimination cases grant compensatory and punitive damages rather than liquidated damages. Attorneys’ Fees and Costs: If you win, the court can order your employer to pay your disability discrimination attorney fees, including expert witness fees and court costs. Disability discrimination in the workplace violates your rights. An ADA lawyer or disability discrimination lawyer can help if you experience workplace harassment based on your disability, employment disability discrimination, or another form of disability discrimination in the workplace.